Story of a walk through the Shire of J.R.R. Tolkien's imagination from Bath to Chipping Campden. Visit Old Sodbury and Broadway Tower, Hetty Pegler's Tump and Wotton-under-Edge.... The story is full of practical tips and will give you a feeling for doing it yourself, finding your own pace, getting lost, meeting the locals and finding yourself again. The Windrush Way is for those who prefer fewer hills and more villages. New edition includes "Walking Notes" and sketch maps. 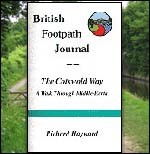 #BF84806 88pp This is a British Footpath Journal. Supperless in Painswick... Crossing the canal, I passed a public (private) school before heading uphill to Three Bears Wood! No bears (or bulls) to be found today however ... so I left this whimsical woodland and entered the larger Standish Wood, where I sped along the wide forest path. Once again I was a Strider through the hinterlands of the Shire. I was enjoying this. Just then a movement caught my eye. With a rustle and a flash of color, something dis-appeared into the trees about fifty yards in front of me. It appeared to be quite short, and was wearing some garment I did not immediately recognize. A child, perhaps? There! Another sound --this through the trees. A muffled clanking noise, followed by a leathery thud, as if someone were saddling a horse. This was growing curiouser and curiouser. I caught another glimpse of trailing garments, this time accompanied by a voice, "Merry, look over here!" Merry?! I increased my pace, searching the woods to my right for the owner of the voice. The path, however, turned sharp left and catapulted me into a large clearing, where I found myself surrounded by a scurrying throng of waistcoats and wooden carts and pikestaffs. Not to mention clanging armor and whinnying horses. Cripes! I thought, there really are hobbits in these hills. And Tookish hobbits at that. About two hundred of them, by my rapid estimate. What the bloody hell was going on here? What was going on was a bloodless re-enactment of the Battle of Gloucestershire! The colorful costumes belonged to members of the English Civil War Society, out in force to celebrate the Roundhead victory over Royalist troops, more than 350 years ago, on 7 September 1643. Here they were, dressed in black broadcloth vests and trousers, with billowing white shirts and felt hats for "helmets." They carried long pikes, muskets and swords, plus carts for carrying goods. The ghost of Oliver Cromwell doubtless rode somewhere among the troops, with a worried expression on its Puritan face. I arrived just as the group was setting off on a three-mile march. Not everyone went, however, some of the older folk not feeling up to the long walk. I struck up a conversation with one white-whiskered fellow in full regalia. We also took photographs of each other. He will serve as a "Hobbit on Holiday" for my scrapbook. I'm not sure what kind of curiosity he considered me. Had I been more alert -- or awake -- I might have marched along with the group, and perhaps learned what moves 20th-century English hobbits to take up pikestaffs and matchlocks. As it happened, I looked at the map (six miles to Painswick, the next village), and meekly followed the designated path to Haresfield Beacon -- an old hillfort site with excellent views and barrow mounds. From there I could look back, and see the last of the Civil War Society brandish their broadswords and join the rollicking march.... I couldn't help thinking it might have been less odd, had they turned out to be hobbits, after all! -- Best value of a half dozen guides to this walk.